In post war Ostrobothnia, employment opportunities were rare and many young people emigrated to Sweden. Nils Ahlbäck, from the small village Terjärv, wanted to remain living in his home village, and this meant that he was forced to create a job for himself. In 1955, Nils Ahlbäck founded the company Rani Plast together with his brother Alf Ahlbäck and the partners Runar Svartsjö and Ingmar Albäck. The company got its name from the initial letters of the four founders’ names. The seed for Rani Plast had been planted a few years earlier when Nils Ahlbäck, in Sweden, had the opportunity to watch how extrusion is carried out. That doesn’t look very difficult, he thought. In order to set up the business he had to take a bank loan so large, that he doubted he would ever be able to pay it back. At that point, he could hardly have imagined that Rani Plast some decades later would be an international group with a thousand employees and a turnover of nearly 250 million. The road to success has not been all that straight though. In the 50s plastic was a new and unknown material and at the beginning it required much effort to convince people that plastic was better than old solutions. The first products were plastic sewer pipes, but they were unsalable because people were convinced that they would be eaten by rats. The polyethylene bags were better received – the customers were thrilled that they could see the products inside the transparent bags. One of the reasons to Rani Plast’s success is that the company all since the start has dared to make bold investments in new modern machinery. Before installing the first printing and welding machine in 1959, the bags were welded by hand. The people in Terjärv naturally worried that there would not be any more jobs for them now, as a consequence of the automation, but Nils Ahlbäck assured them that it was just the opposite. And he was right, before the end of the 1960s there was a shortage of labour in the region. Over the years Rani Plast has also grown through acquisitions. A good example of the company’s ability to seize opportunities was the acquisition of a factory manufacturing electrical insulation film in Tervakoski in the early 1980s. Even though the product was completely different from the rest in Rani’s product range, the company decided to invest in order to have more legs to stand on. Similar investments followed in Slovakia and Ukraine, and today Rani Plast is world leading in the field of electrical insulation film. A company that wants to grow must look further than to the domestic market. 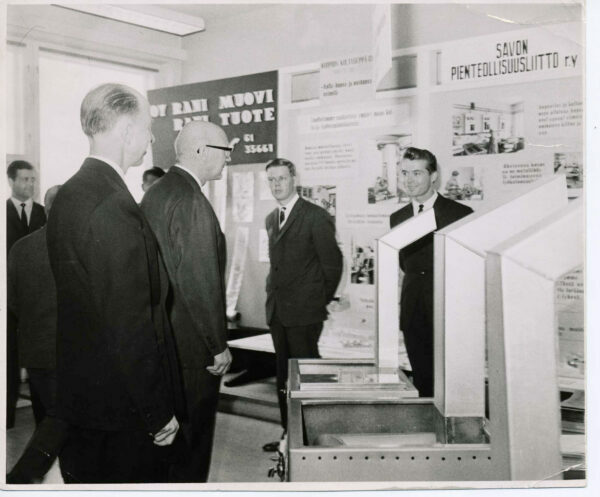 Early on, Rani Plast saw the opportunities of internationalisation and export to the neighbour countries Sweden and the former Soviet Union was soon initiated. The investments in the East have continued; in the beginning of 2010 an important step was taken when Rani Plast built a factory of their own in Russia. Despite investments abroad the roots are important for Rani Plast. That is also the reason why the factory in Terjärv has been expanded, time after time, to become one of northern Europe’s largest production facilities for polyethylene film. Generational change started in the mid 1980s and today the company is owned and led by Nils Ahlbäcks children UIrika and Mikael Ahlbäck. Nils Ahlbäck passed away 2014. Till the last years of his life he used to regularly visit the factories and office in Terjärv, even if 30 years has passed since he left the day-to-day running of the company in the hands of the younger generation.